Please note: For sanitary and hygienic reasons, this item cannot be returned unless it arrives damaged or broken. Clear My Head is a natural remedy for stuffy noses. 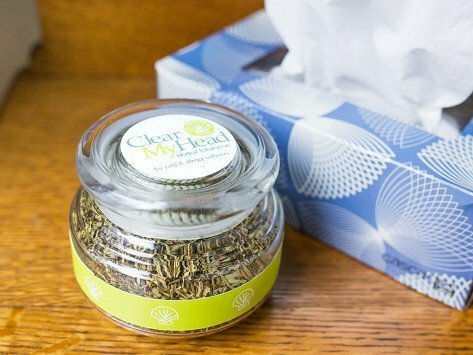 It can relieve sinus pressure and even headaches—breathe from the jar of seven herbs and essential oils, or mix into hot water for a steam treatment. Avoid the side effects and lingering odors of menthol rubs with this aromatherapy alternative. Dimensions: 4" x 4" x 3.25"
This is my most favorite gift— that I have bought for myself! I have very bad allergy and this helps . I love the herbal mix. Opens my sinuses up. It helps me cut back on meds. Brenda makes Clear My Head in small batches to ensure freshness, and packages each jar with a seashell (a reminder of her childhood in the Sunshine State) for scooping.